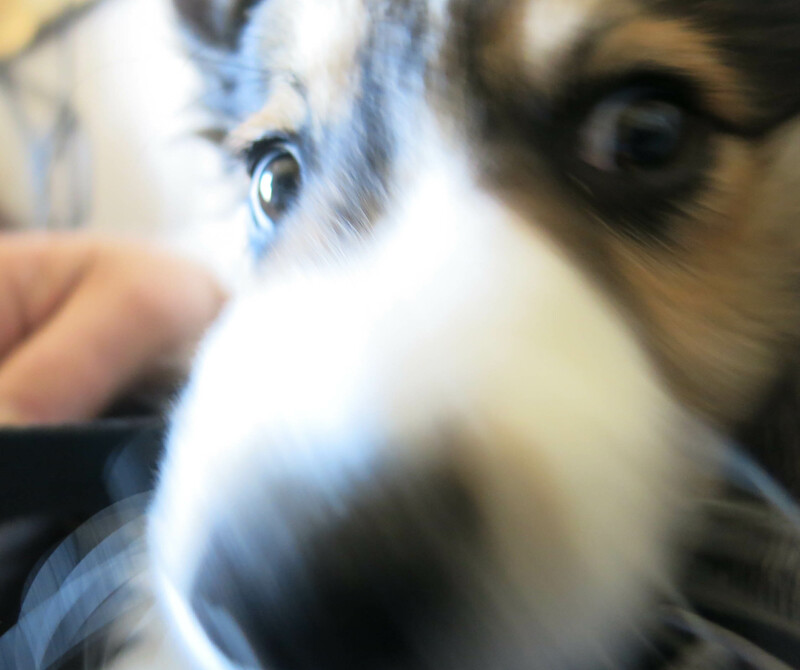 Greetings and salutations everyone; yes, once again it is I, Mani the purebred border collie, filling in for the guy I live with, and here to tell you all about my day. I have one obligatory plant picture for you, too. You may remember me from such posts as “The Couch–An Interlude”, among at least a few others. Here I am in a characteristic pose. I had a pretty good day, even though I was left alone for a little while. I stayed in my fort. When the guy I live with came home, I was very happy. I had lunch, and we went outside to look at things. He got all excited by this plant, which I can see, because it’s blue, and about the right size for me. Then I started to think about things. This is me looking thoughtful. I forget what it was I was thinking about. It was interesting, though. After a while, the guy I live with sat on the couch, hoping to “get a cute picture” of me. He had the camera with him, of course. 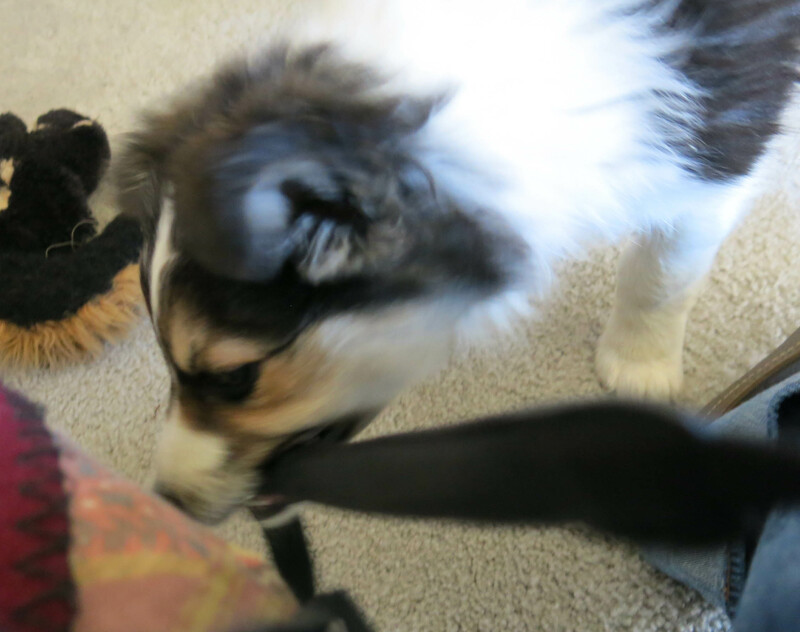 Now, what you may not know about tiny border collies like me is that we like attacking stuff. Like, pretty much everything. And we move very fast, as the pictures will show. 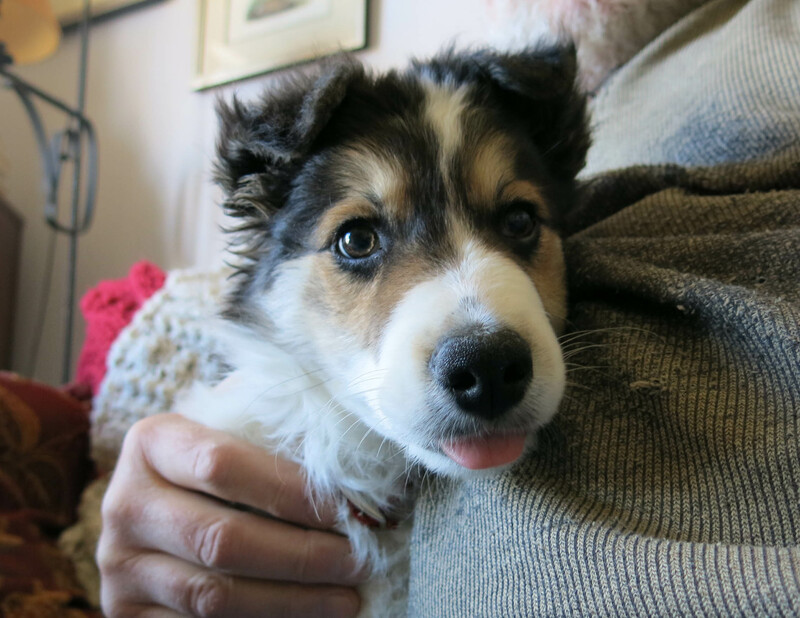 I stuck my tongue out at the camera. Then I got closer. I grabbed the strap. The guy I live with reminded me that the camera “cost more” than I did, which I thought was fairly below the belt, if you know what I mean. The guy I live with thought this was “only moderately funny”, and it didn’t take long for me to realize he was right. There were a lot more interesting things to attack. This was the best one. That was pretty enjoyable, believe me. Then I spent some time looking out the upstairs bedroom window, and snacking on the tecoma next to me. He put a cage around the tecoma a couple of days ago. Like that would stop me. The guy I live with yelled at me and moved the tecoma into the spare bedroom. So, since I was upstairs, I found something else to do. You should have heard what he said. 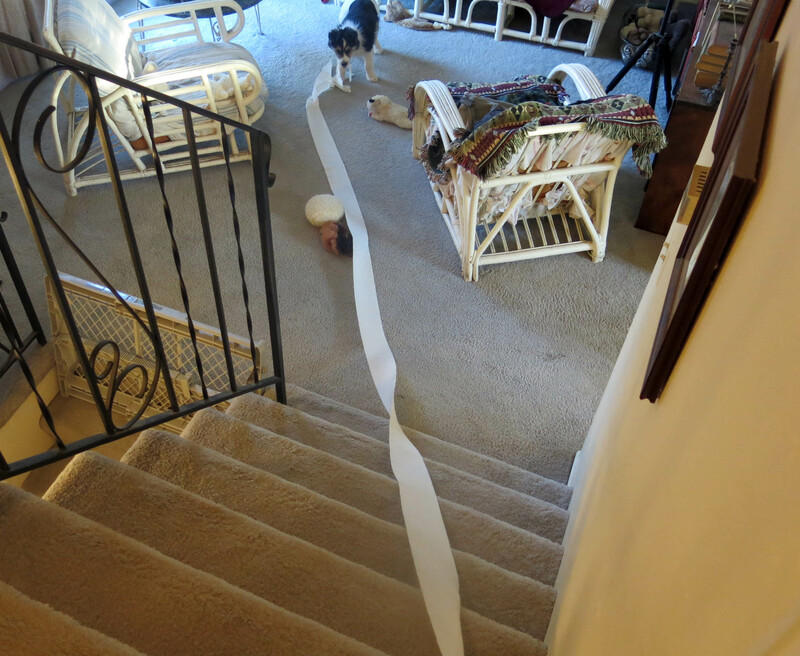 He went up the stairs, into the bathroom, and started rolling up the paper, but guess who was faster? If this hasn’t been an excellent day, then I don’t know what excellent means. And of course I do. Exactly what I say. I didn’t get done with my redecorating, though. So Mani, not that I want to stir up trouble or get you yelled at again or anything, but have you explored the shoe situation? I mean, if the guy you live with has some old holey ones, you may be doing him a favor. There are some boots, and I kind of like those, but right now I’ll chew on anything. As maybe you can tell. Oh no, the guy you live with is in for it now. That paper on a roll is the most fun ever. Even cats like playing with that. Yes, I discovered this just today. It’s really great. The guy I live with says this has happened before, in the past, so it didn’t come as such a huge surprise. And he was carrying the camera. 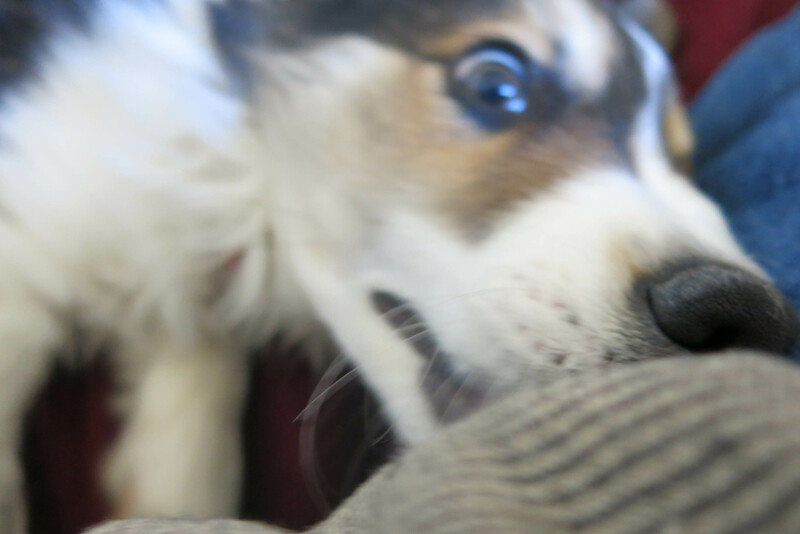 I am equally impressed by your razor-sharp teeth, Mani, and by the camera’s ability to capture the action. The guy you live with must have thick skin. I agree with you that the cage protecting tecoma is inadequate. If available, tecomas are for munching, and before being moved that tecoma is available. 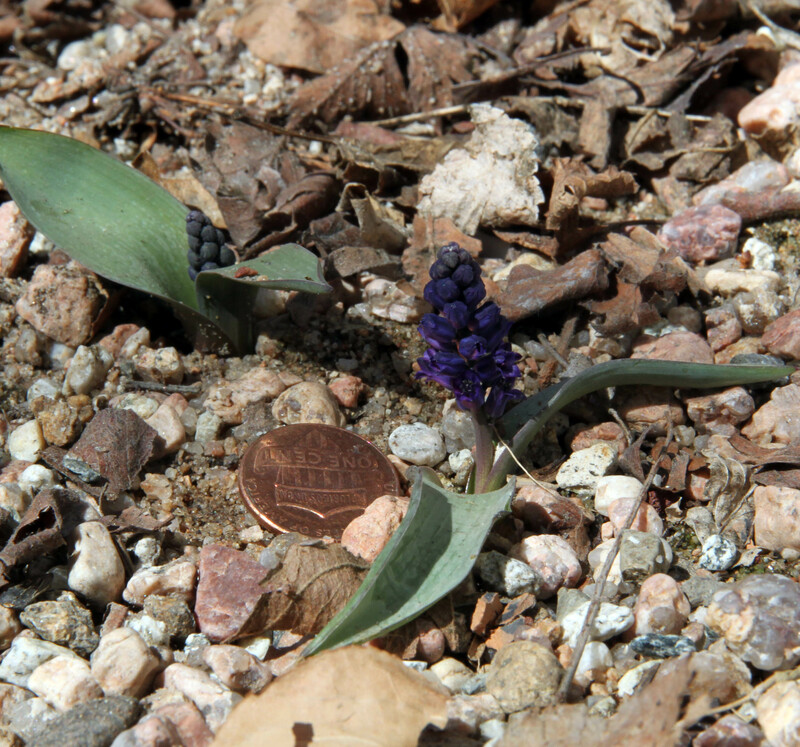 How wonderful you can see blue because the blue of Hyacinthella glabrescens is totally worth looking at. Wonderful too that you don’t need to waste time plotting mischief — the fun is presented to you, begging to be engaged in. The guy I live with is a gardener and so his fingers are tough. They make excellent chomping. The tecoma got moved; it was grown from seed by his friend who is no longer here, and so he has a special feeling for it. So do I. I can see blue and yellow. The guy I live with says he sees red, and I’m not sure what that means, but I did get a lecture about the tecoma, and the toilet paper, and some other things that I’ve forgotten about. That’s what all the purebred border collies have gotten: lectures. 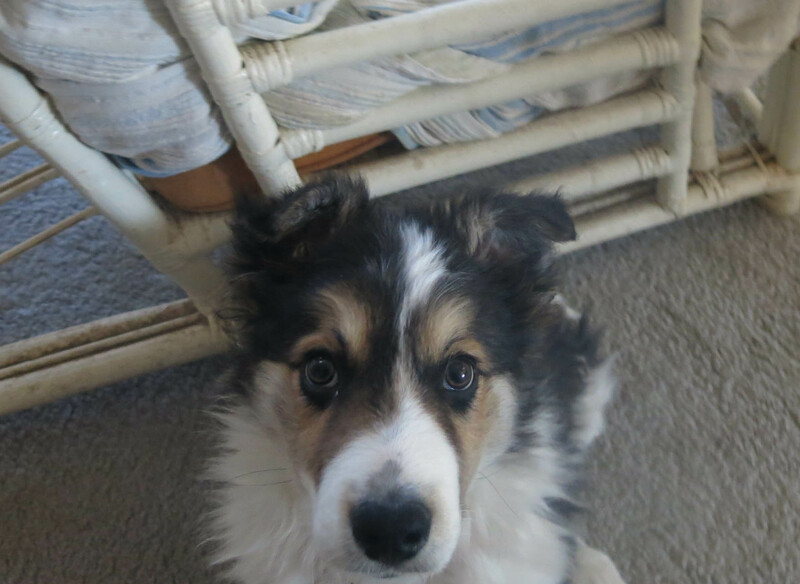 I hear that the first border collie who lived here would say “Another lecture” and then pretend to listen. The one thing we don’t get is punishment, because that’s a human concept and purebred border collies are dogs. Instead, there are lectures. Sometimes they last for an awfully long while, and I have trouble staying awake. I don’t take notes or anything. 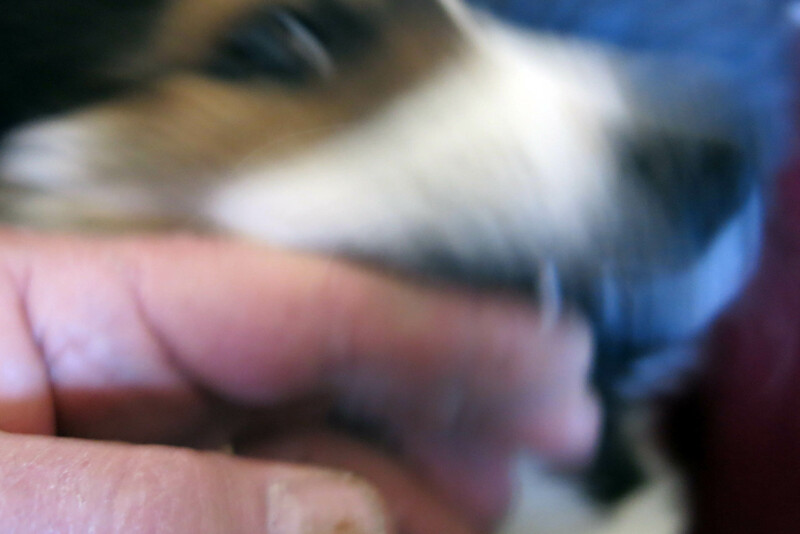 Humm, Mani, it looks to me as if you are biting the hand that feeds you! You might want to rethink that. At your age (and cuteness) you do need to chew. 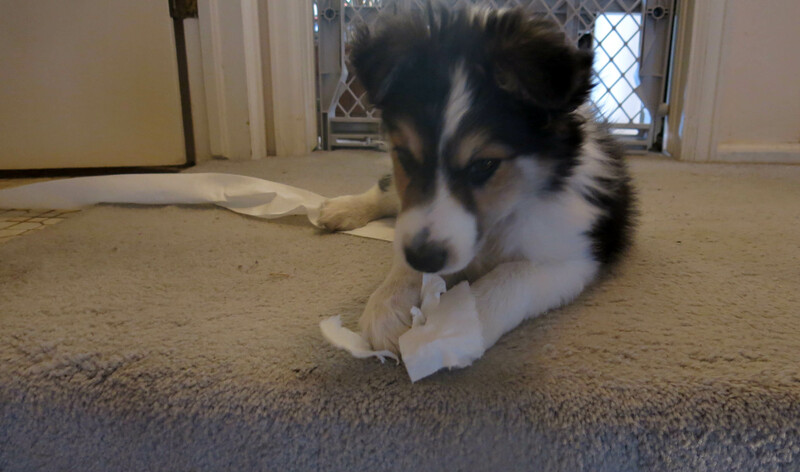 Your person will probably get you some things approved for cute puppies to chew on. What fun you will have this Spring when the snow is gone. Have a continued good time training your human. 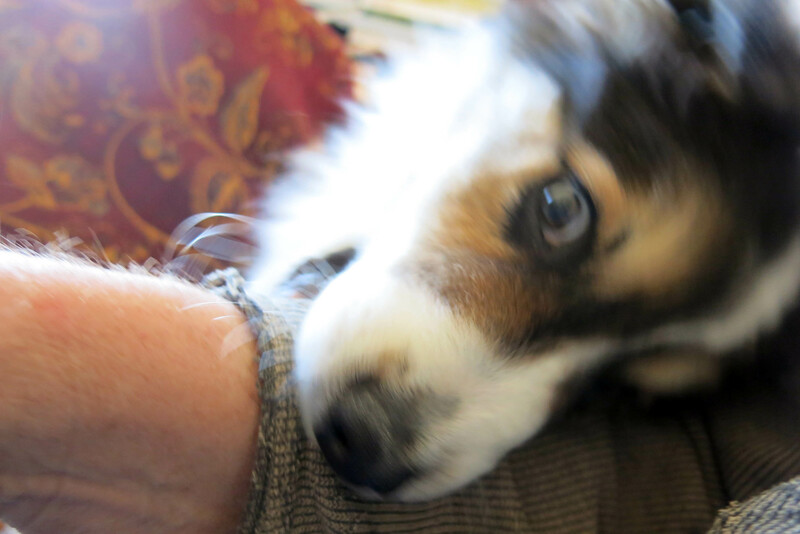 Ha ha, biting the hand that feeds me. I am, aren’t I? He doesn’t mind much. Though sometimes he stuffs a toy into my mouth and I chomp on that. The snow is mostly gone; say half gone, but still there on one side of the yard. Slushy, and fun. Here in the UK, we have a brand of toilet paper with labrador puppies in the adverts, doing the same as you with toilet rolls. They are cute, but not as cute as you. I’m afraid the bathroom door will be closed from now on. It isn’t that the guy I live with hugely minds this, it’s just that it’s hard to roll back up, once it’s been unrolled. So it just gets piled up in the bathroom. As we sometimes say around here, suppose the Queen of England came to visit, and saw a huge pile of t.p. She is a famous dog lover–working dogs at that. The main difference is that she has someone on staff to clean up. That’s the ticket: you just need a ‘clean-up person’ ask your human about taking care of that. I have a clean up person. He is, in fact, a compulsive cleaner. Not like a weirdo or anything, he just likes vacuuming. It’s important to know the mouthfeel of everything, so you gotta chomp and chew. As Barb said, it’s a lot funnier seeing it through the computer screen because I don’t have to clean it up. I haven’t even begun to try everything yet. Like, I haven’t even been downstairs. What wonders lie beyond the gate? 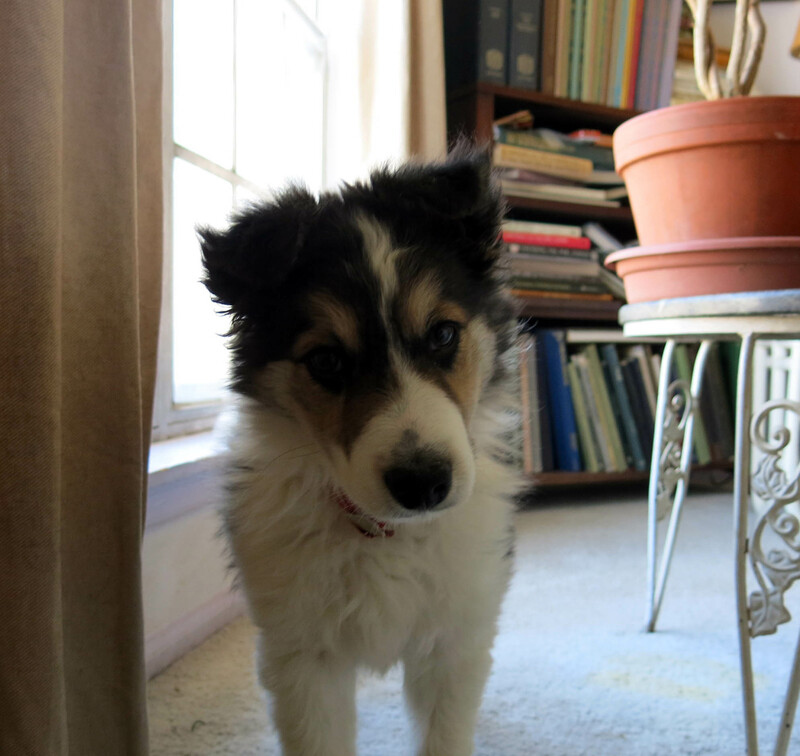 So, essentially, tiny pure bred border collies are just a fluffier version of the Tasmanian Devil. 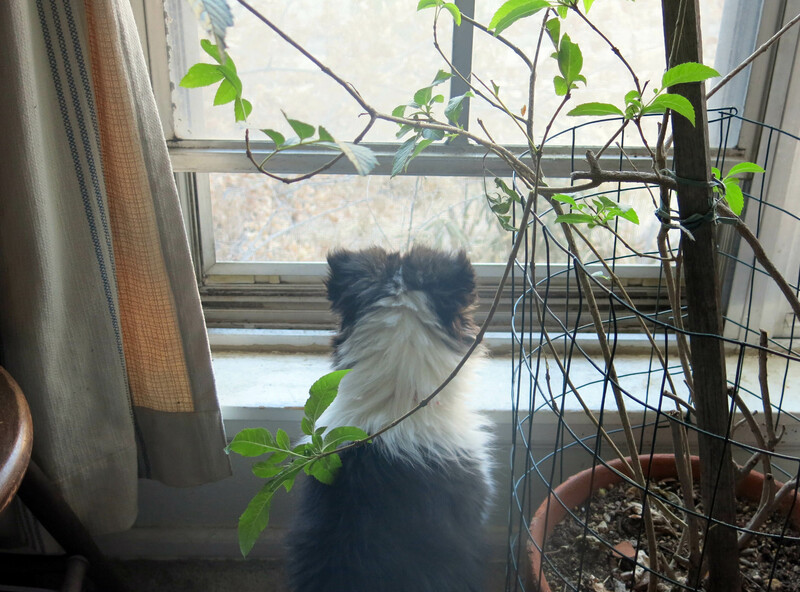 I would think that even tiny pure bred border collies have excellent eyesight, the better to herd sheep or chew sticks with, but if The Guy Who Gardens can spot a flower the size of a ha’penny, I’d say that that guy could also probably herd electrons. Pretty much just a smaller version. Though, you have to admit, since there’s not a huge amount of gardening going on right now, just looking at stuff and fiddling with seeds, that my adventures can add some interest to the blog. My grammy says to put the toilet paper on the roll so that it feeds from the bottom, rather than rolling off the top. This adjustment essentially removes the entertainment value from the toilet paper, or so she says, having done this when my uncles were toddlers. My grammy says she’s seen a lot. And forgotten too little. Although she is forgetting more and more these days, just not of the right things…. The guy I live with is forgetting a lot of stuff too, but not the things he wants to. The only trouble with turning the roll over is, well, never mind. Absolutely hilarious. I can truthfully say it made me laugh out loud. Your tooth looks very sharp. Thanks; I got yelled at an awful lot today. And of course cuddled afterwards. I grabbed the t.p. roll at least twice, and the guy I live with was all yelly and stuff, partly because he was laughing at the same time, when I wasn’t supposed to be doing this, I guess. All I can say is it’s a good thing you’re so darn cute! It lets me get away with a lot, doesn’t it? I unrolled the paper twice yesterday, and ran around the house with it. Fun. I even did it with the paper coming from the bottom. 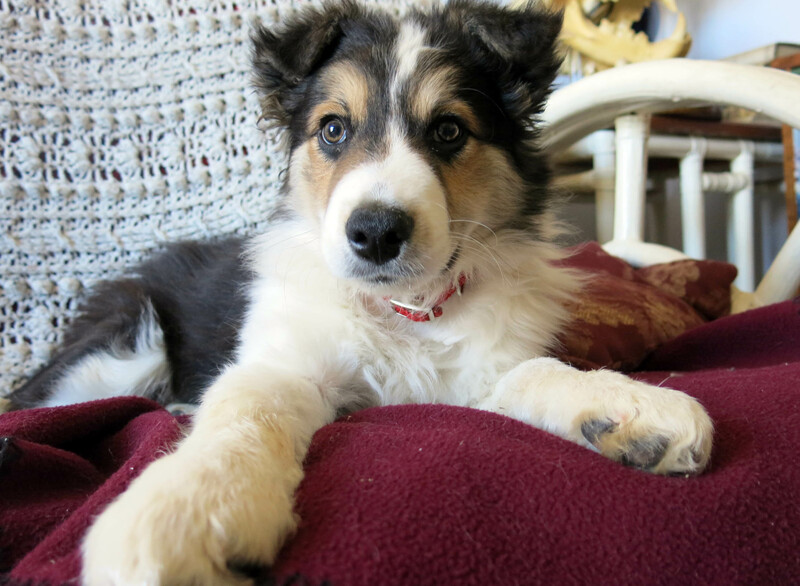 Tiny pure bred border collies are so wicked smart that it’s hard to out smart them, esp. when it comes to T.P. fun. Yes, I’ve already discovered who’s smarter….. I forgot to add: Dear Mani, teeth off the lady of the house’s stuff. One day, you’ll understand why. Yes, sigh, I already got in trouble (a lecture) when I tried to chew an Archy and Mehitabel book. Being cute gets me out of a lot of t.p.-related trouble. I can run pretty fast, too.